Chris Haslock's career appeared to be slowing in 1991, but he tried to stay optimistic, he told The Los Angeles Times. Haslock was in his fourth professional season. He'd yet to see AA. "You never know. Just screwing around in the bullpen, I may come up with a pitch that turns out to be something new that they can't hit," Haslock told The Times. "There's always a chance as long as you're playing." Haslock went on to make AA for the Padres later that year. That year, though, turned out to be Haslock's last. He never made the majors. Haslock's career began in 1988, taken by the Padres in the 27th round of the draft out of Cal State-Dominguez Hills. At Dominguez Hills, Haslock won first-team all-conference honors in 1987 and second-team in 1988. He also won second-team all-region in 1987. Haslock started with the Padres at short-season Spokane. He got into 23 games in relief, posting a 3.99 ERA. He went five innings of scoreless relief in an August 16-inning contest. He made single-A Riverside for the playoffs. 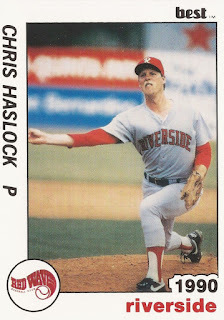 Haslock moved to single-A Charleston for 1989. That June, he gave up his first home run as a pro, having avoided doing so over his first 80 pro innings, according to The Times. "I really thought I never was going to give one up," Haslock told The Times later. "I really just couldn't see it. I don't think it's going to happen again for a very long time." Overall, Haslock got into 56 games that year, posting a 1.78 ERA. He gave up three home runs and saved 10 games. He moved to high-A Riverside for 1990. His ERA increased to 4.91 over 43 outings. He then played 1991 between high-A Miami, High-A High Desert and AA Wichita. He got 10 outings, one start at Wichita, amassing a 6.62 ERA. It was his final year as a pro.